An academy which opened just five months ago has been put into "special measures" after parents complained to England's schools inspectors, Ofsted. The head teacher and the chief executive of the Richard Rose Central Academy in Carlisle are to leave and new leaders are being brought in. The academy was closed for a day on Friday as pupils staged a protest. Parents said children were not safe. It is only the second time Ofsted has judged an academy to be failing. Unity Academy in Middlesbrough was labelled as failing its pupils in 2005. Academies are the flagships of the Westminster government's programme to improve England's schools. They are semi-independent state schools set up with backing from private sponsors. Ofsted inspectors paid an emergency visit to the Richard Rose Central Academy after complaints from parents, who said they feared for their children's safety because of staff shortages. Now inspectors have given the academy the lowest rating possible - "inadequate" - and put it into what is known as special measures, meaning it gets intensive support to improve. Head teacher Mark Yearsley and chief executive of the Richard Rose Federation, which runs the school, Peter Noble are leaving. Former head teacher and head of the government's Innovations Unit Mike Gibbons is being brought in to get the school back on track. He will be the federation's new chief executive, backed by Russell Wallace as interim director of the Central Academy. Ofsted's report, released on Wednesday evening, says 90% of parents who responded to their questionnaire said they had "serious concerns" about their child's welfare, safety and education. 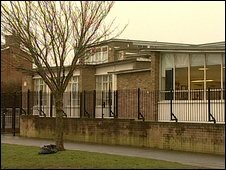 Inspectors wrote that the school was failing to give pupils "an acceptable standard of education" and that those leading it were not "demonstrating the capacity to secure the necessary improvement". "The academy's senior leaders underestimated the levels of challenge presented by the amalgamation of the two schools serving different communities", they said. Brian Scowcroft of the Richard Rose Federation said: "We fully accept the Ofsted findings and I want to reassure students, parents, teachers and the local community that we are already addressing the issues they have raised and they are starting to have an impact. "Our top priority is to ensure high standards of teaching and learning for all our students and that necessary support is provided for staff and parents to meet this goal." Parents of children at the academy learned the news from Ofsted inspectors on Wednesday evening. Students' complaints about lack of teachers and poor teaching gathered pace on the internet last week. Speaking earlier on Wednesday, Carol Thompson, who has three children at the school, said the main problem was a shortage of teaching staff. She said her children had been worried about going to school since she voiced concerns about it to the media. She accompanies her son Reeve, 11, into school every day. Fifteen-year-old Hannah often refuses to go, she says, because she feels intimidated. "I'm annoyed," Carol told BBC News. "The children are being taught in temporary classrooms with no heating and no toilets. "A lot of the good teachers have left, and there are too many supply teachers. "People have had enough of not being listened to." Outside the academy 11-year-old Nicole was dropped off by her mother, but seemed in no hurry to get to lessons. She told us there was "not much learning going on". "It's difficult to get much work done when there's supply", she said. "People just mess around." Schools Minister Jim Knight, who paid a visit last week, pledged to do all he could to turn the school around, saying its problems had not appeared overnight. He said: "I am extremely concerned that the Richard Rose Central Academy has gone into special measures but I am satisfied that the actions agreed with the sponsor in Carlisle will allow the school to move forward with confidence". The academy was formed from a merger between two local schools - St Aidan's and North Cumbria Technology College. But it is currently housed on the college's site. With the aid of many temporary classrooms, two schools have been merged into one. The brand new building - the trademark of so many academies - has yet to get planning permission. Parents claimed rival gangs from the two former schools now pass each other in the same corridors. Teaching unions say this academy was rushed through before it was ready. Chris Keates, general secretary of the NASUWT teaching union, said many of the academy's problems stemmed from the fact that it was "inappropriately fast-tracked". The government wants to have 200 academies open by 2010, but denies any have been rushed through. Many of the students here seem passionate about wanting this academy to do better than the two schools which merged to form it. Ryan, 14, saw his face splashed across a local newspaper last week after his Bebo page called for pupils to make a stand against what they said was the poor standard of education. Now he's urging them to "stick together and help make Richard Rose a better school". This is only the second time that Ofsted has carried out a school inspection after parental complaints. The first school to be inspected in this way was eventually given a "satisfactory" rating. With the academy now in special measures and under new management, it will be be subject to regular checks. Peter Noble, the former chief executive of the Richard Rose Federation, had previously defended teaching there. He said the academy had "made a good start", but had had problems which could not be fixed overnight. In a statement, Dr Mary Bousted, general secretary of the Association of Teachers and Lecturers, said the school now needed to look to the future. She said: "There isn't a magic wand to solve its problems. Whoever takes over will need a huge amount of support to turn the school around. "We firmly believe the academy experiment has failed in Carlisle and this school should now be reinstated under the control of the local authority, which has the knowledge and expertise to run schools."